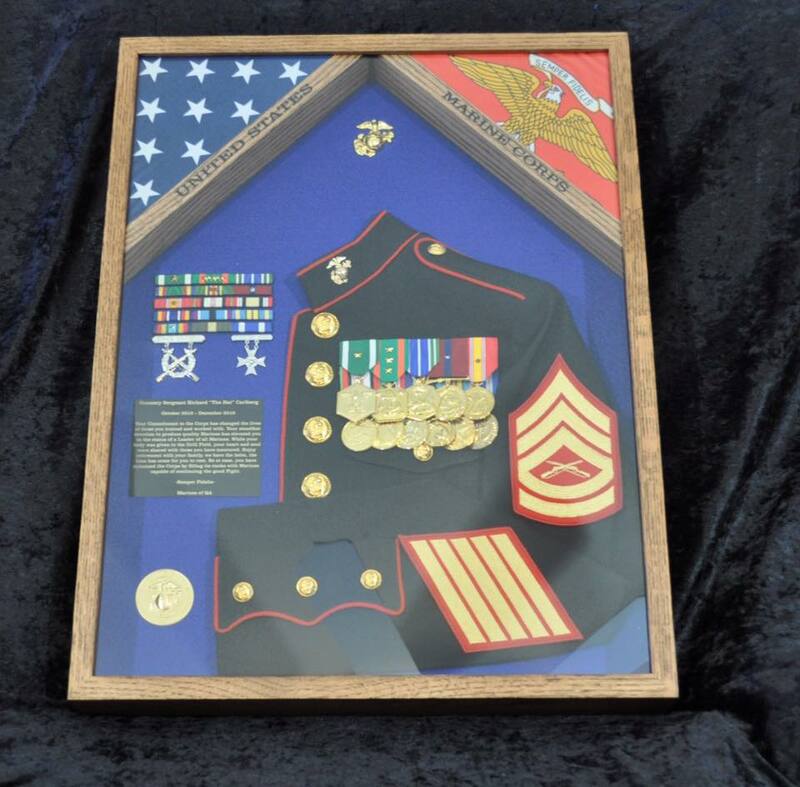 Colpitts Custom Creations builds quality retirement shadowboxes, going-away plaques, challenge coin holders, medal display cases (marathon/race finisher medals, jiu jitsu/karate tournament placement medals, etc), and various other wooden items. 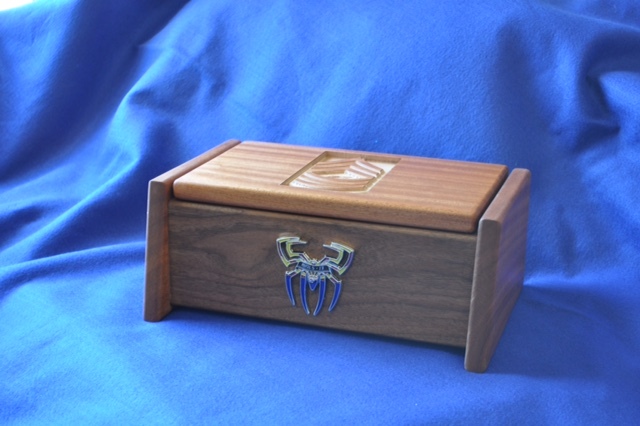 I can also build special request items as well. 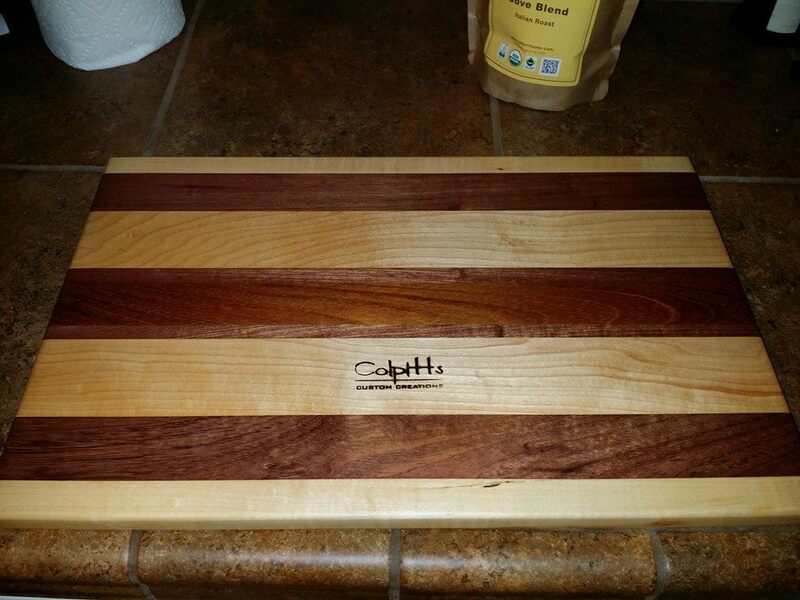 All items are made-to-order from red oak and stained in the color of your choosing. 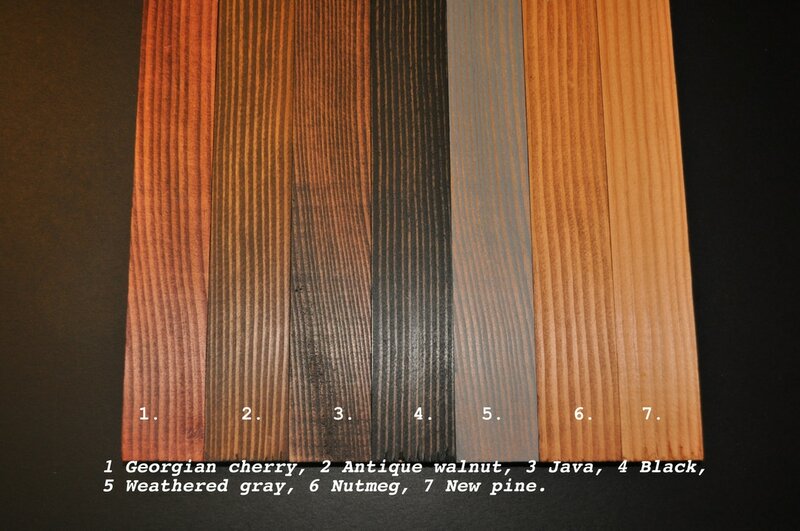 See the gallery below for stain color selections. 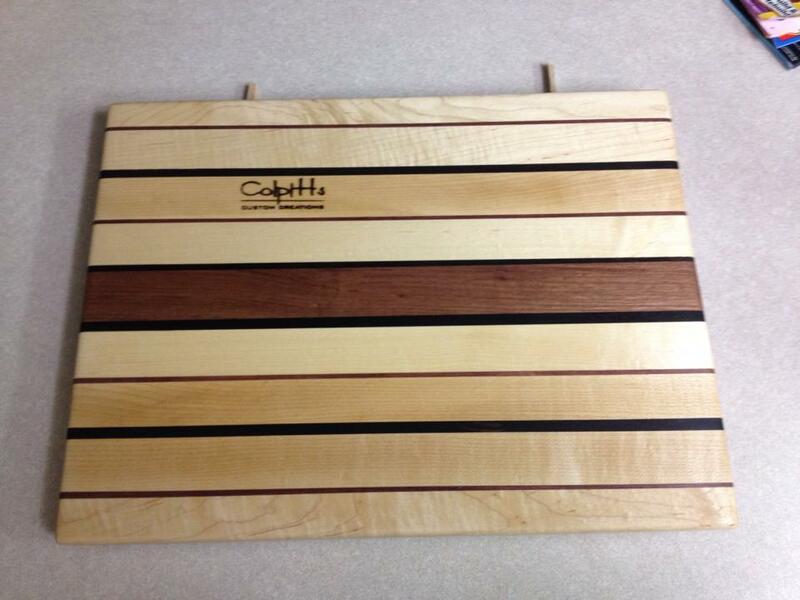 Should you truly want a one-of-a- kind Colpitts Custom Creations product, choose an exotic hard wood. 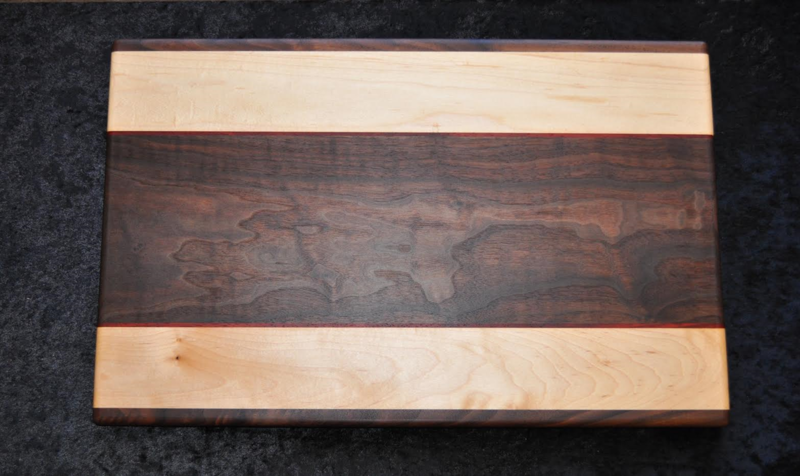 See the gallery below for the exotic hard woods selections. Larger pictures are available on the completed creations page. 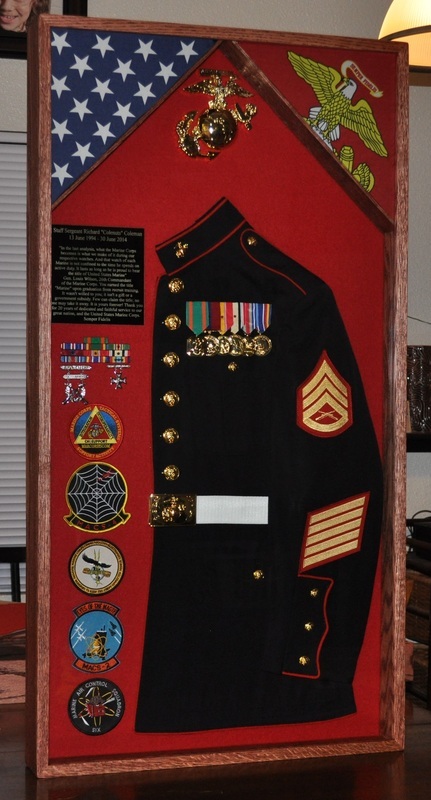 What better way to commemorate a loved ones military service than by proudly displaying the uniform that holds a special place in the heart. 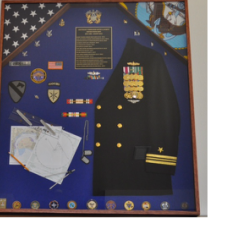 24"X45" Dress Blues Shadow Box. 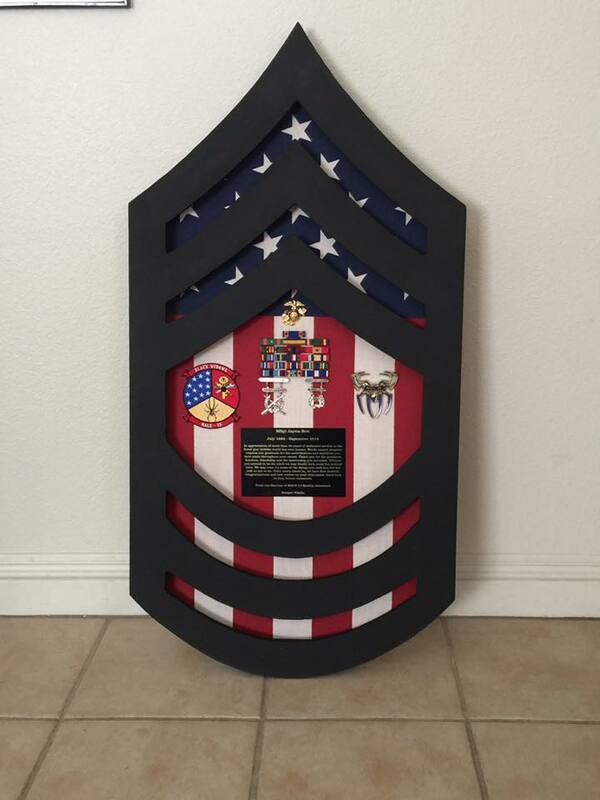 Unit Patches, Medals, Squadron Coins and any personal items not included in the price; all other items included. 3 weeks' notice needed when ordering this item. The 3rd week is to allow for shipping. 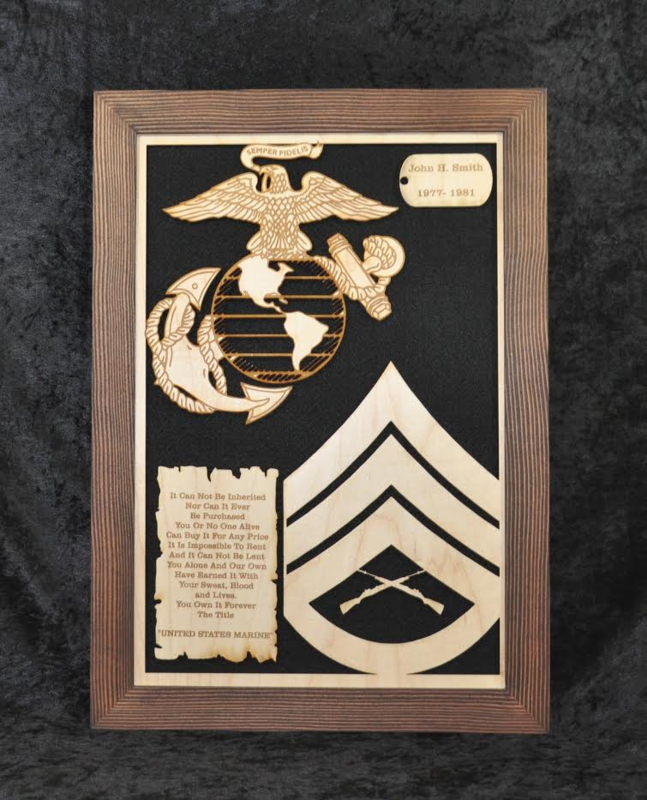 12"X15" Picture Frame Plaque (Enlisted) Can be completely customized to fit your needs. 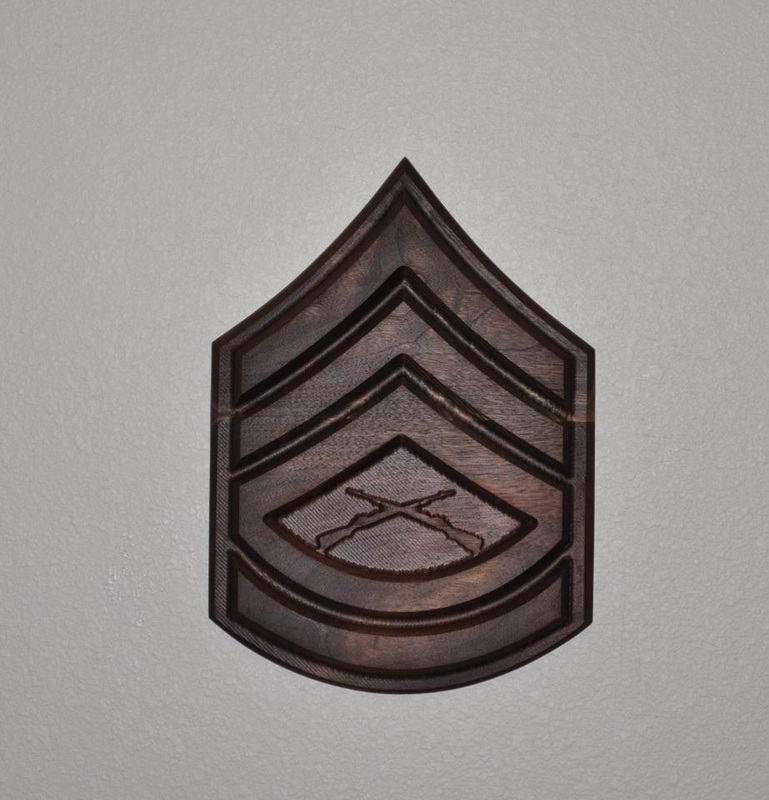 12"X15" Picture Frame Plaque (Officer). 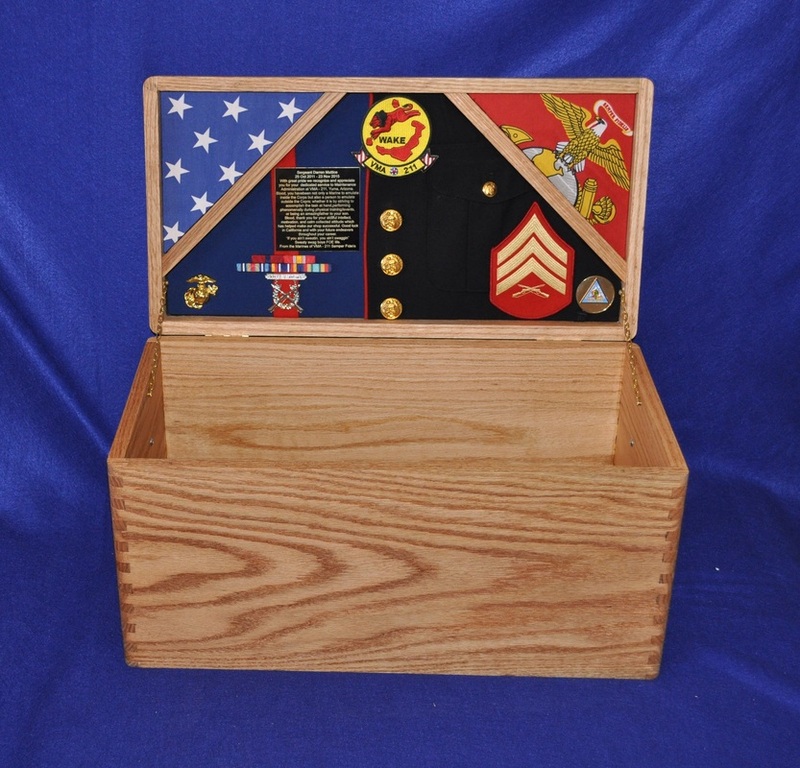 Can be completely customized to fit your needs. 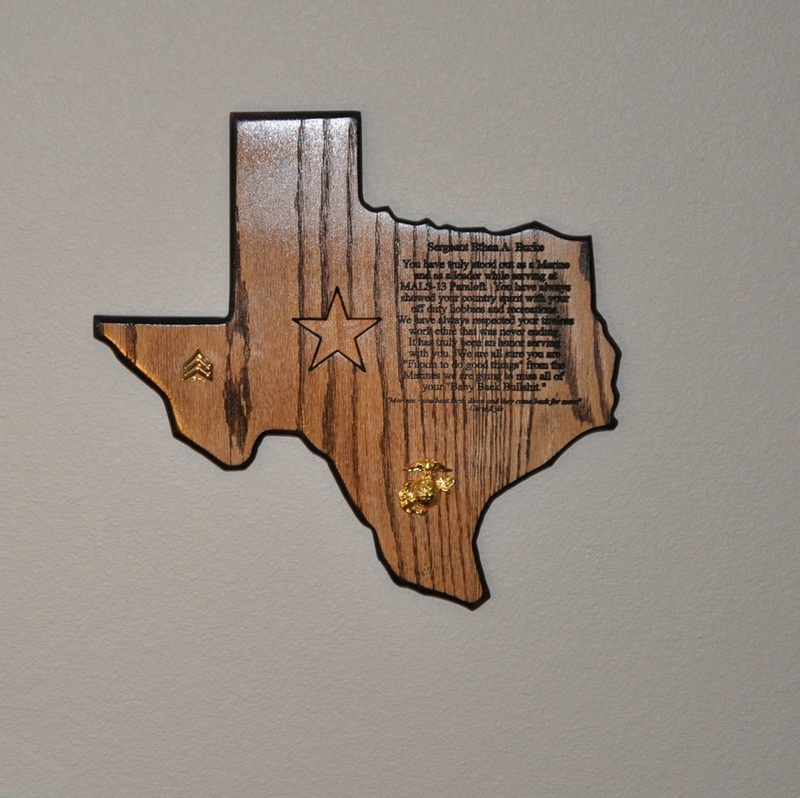 I can make any State, Country silhouette you would like. Just let me know what size and what style you would like it in and I can make it happen. 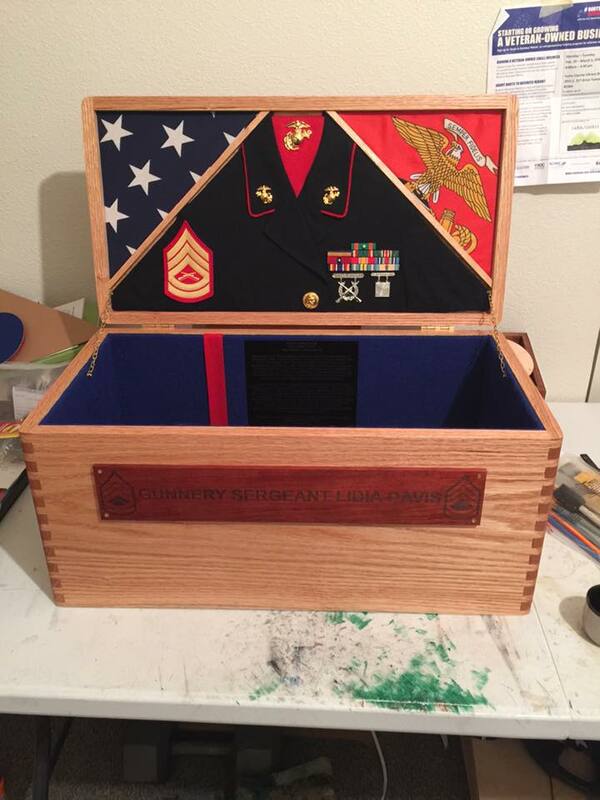 Let me know what state or country you need and what uniform you would like it done in. 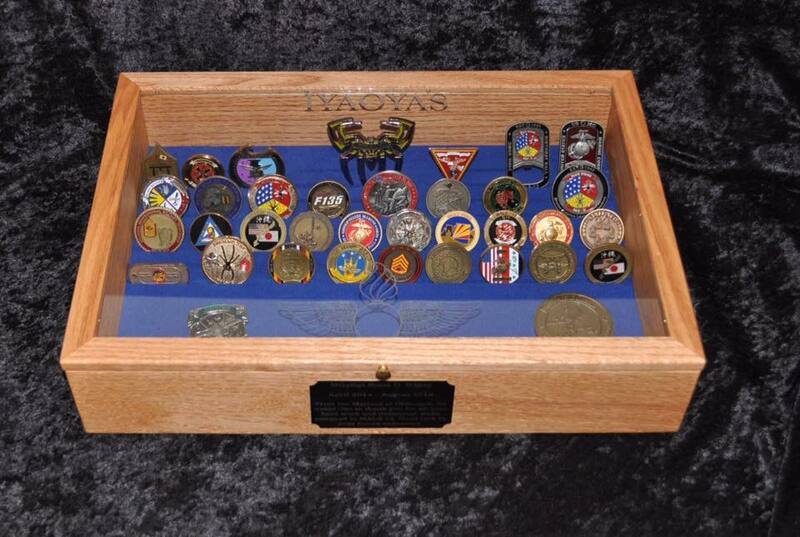 Challenge coin holders. 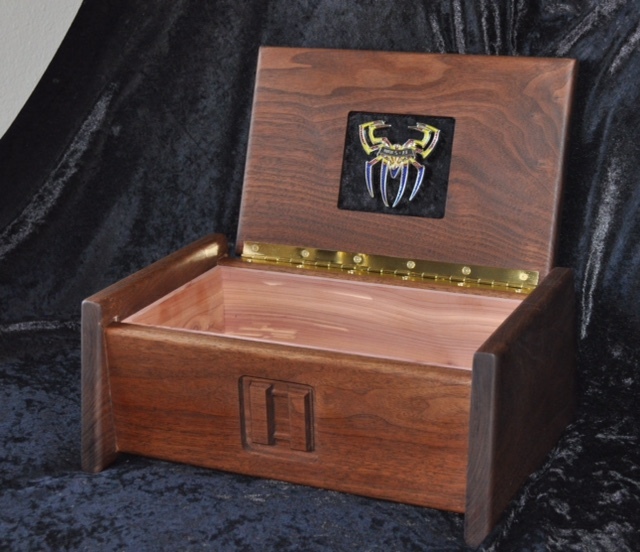 Can be custom-made to fit the size of your collection. 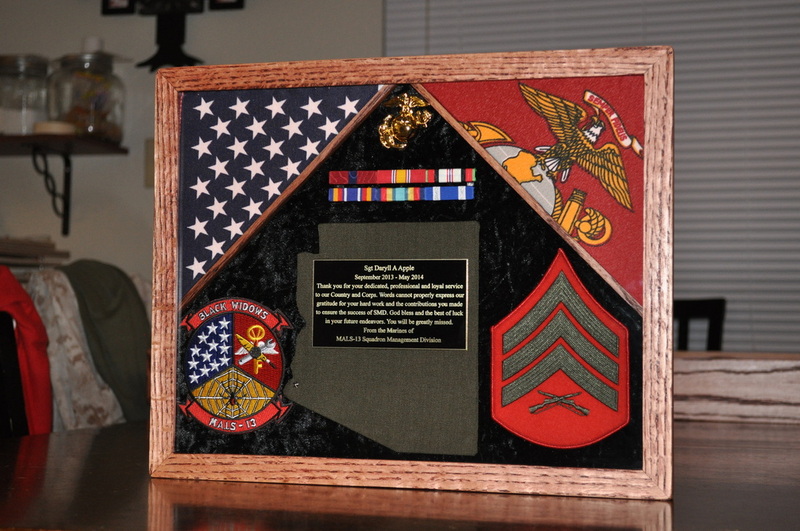 Pick your stain color, background material color, or have the back board stained to match the frame. 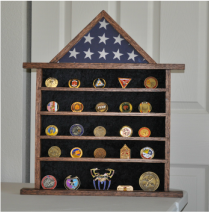 5 Shelf Challenge Coin Holder with Flag Display $150.00. 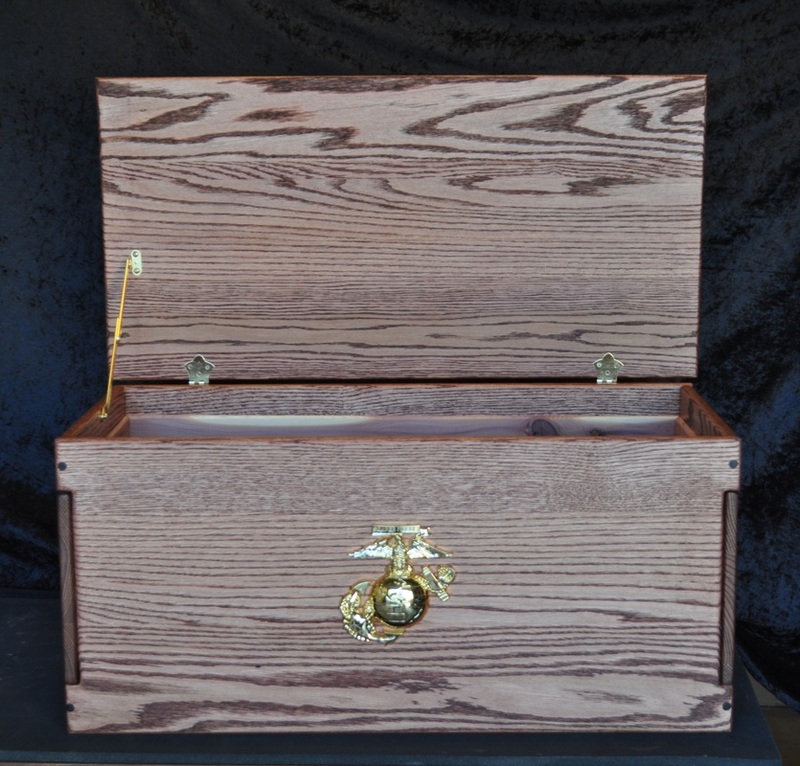 Will hold 30 to 40 coins depending on the size of the coin. 3 Weeks notice is needed when ordering this item. The 3rd week is to allow for shipping. 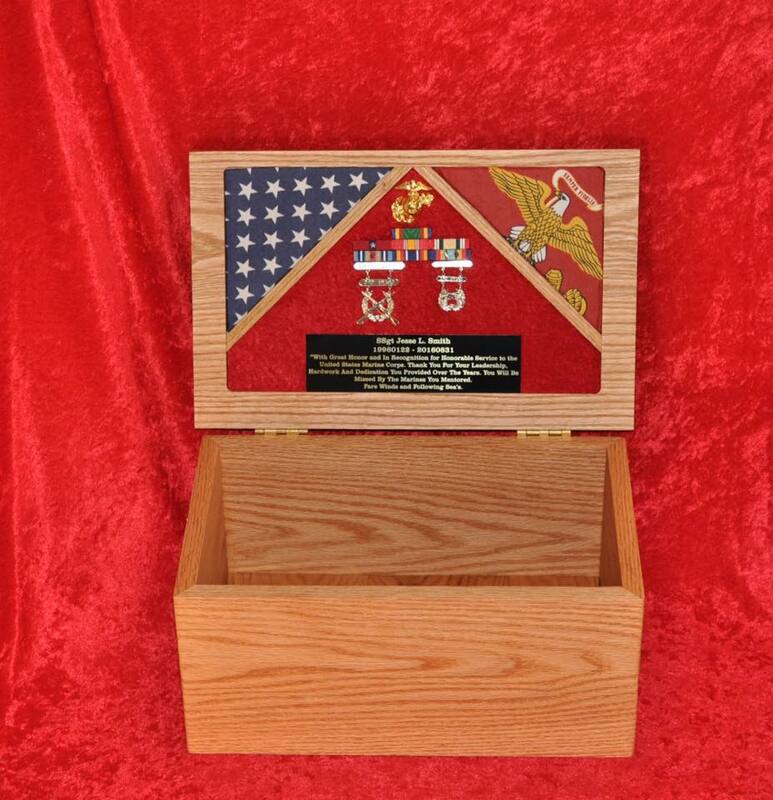 *Price does not include shipping, shipping cost $30.00. 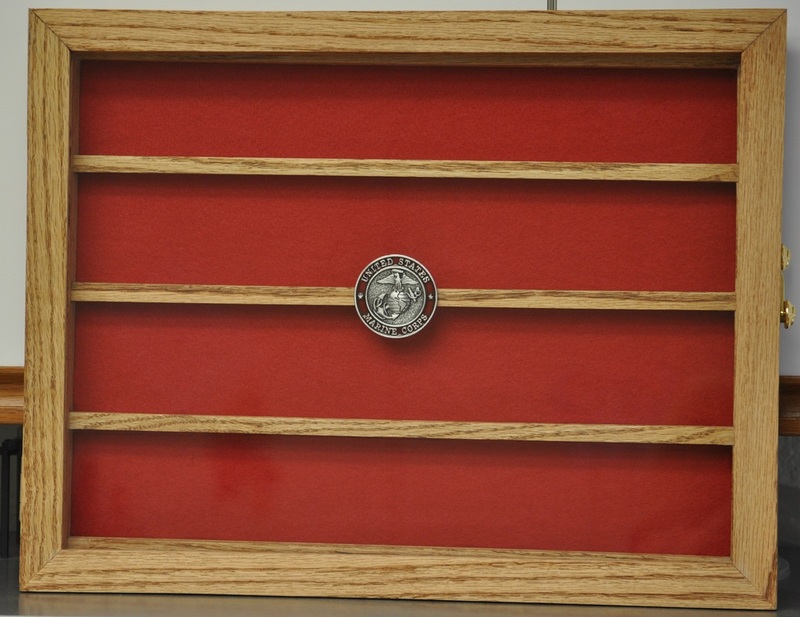 12x15 Challenge Coin Holder Can be customized and stained to fit your needs. 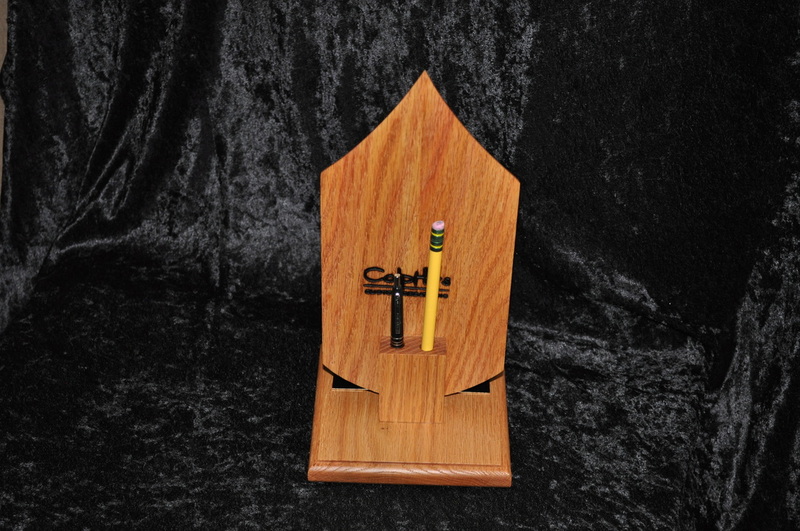 Display your K-Bar with this one of a kind Colpitts Custom Creations Original Design. 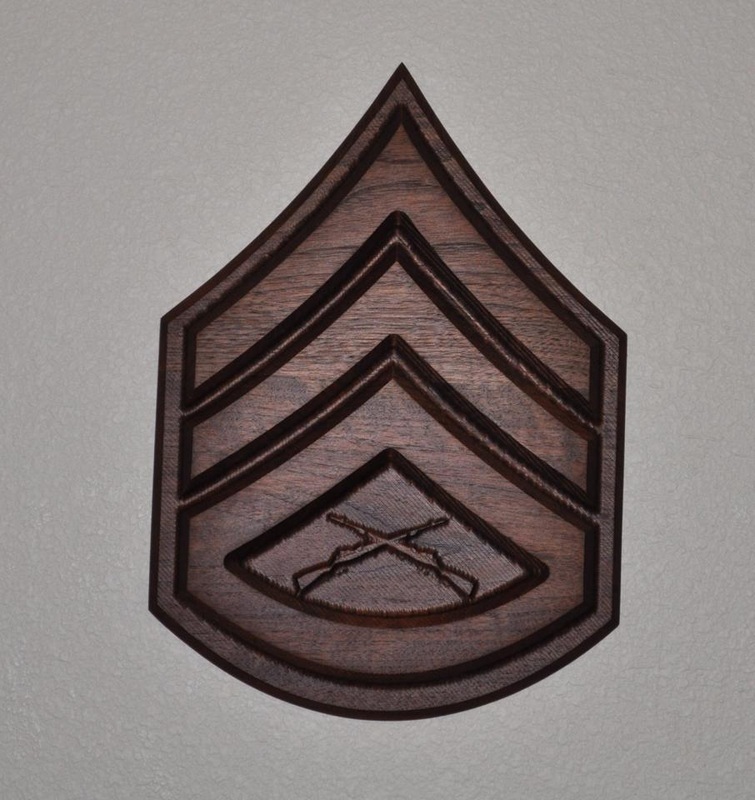 I created this Original design as a unique way to display your K-bar. This can be made to fit a full size K-bar or mini K-bar. 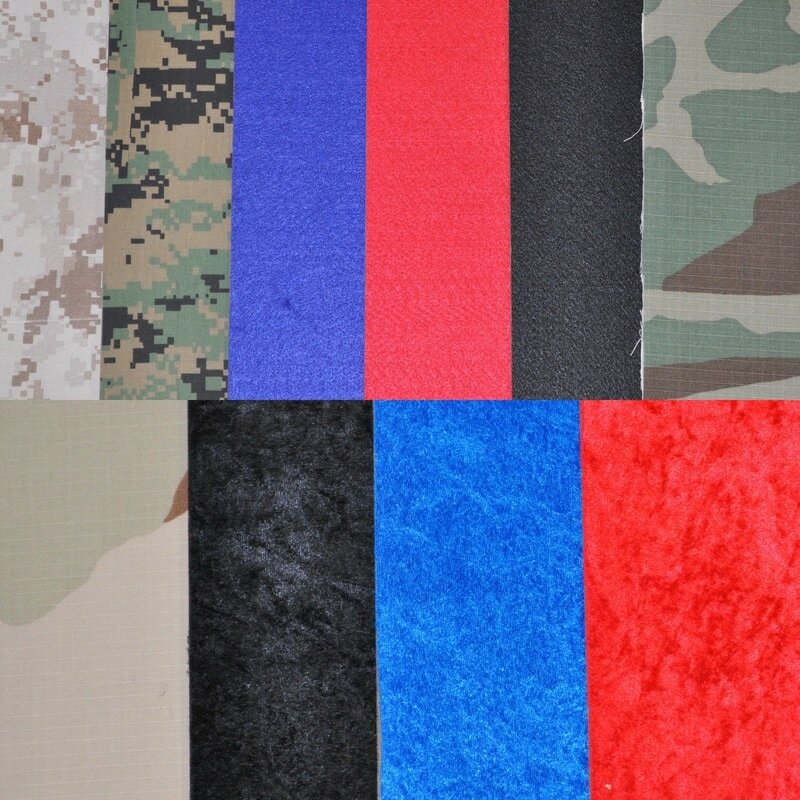 You also have the option to choose your background color or uniform material as well as the color of the base. 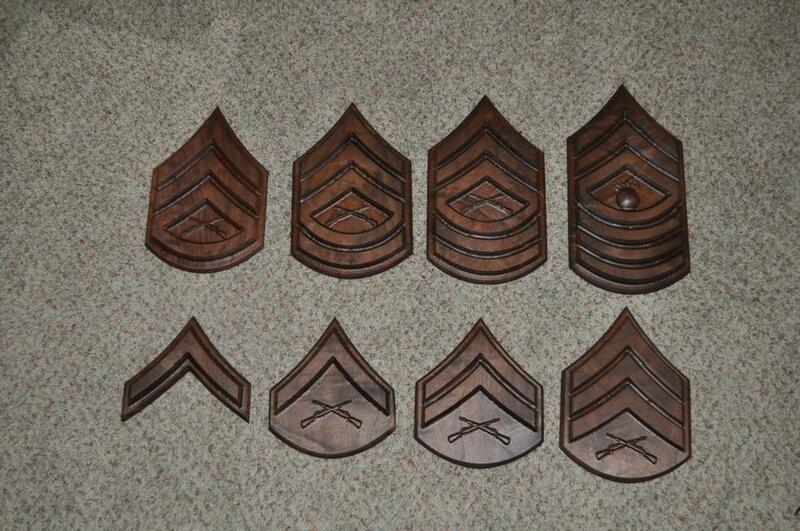 This is a set of Marine Corps enlisted rank from E-2 (PFC) to E-9 (MGySgt). 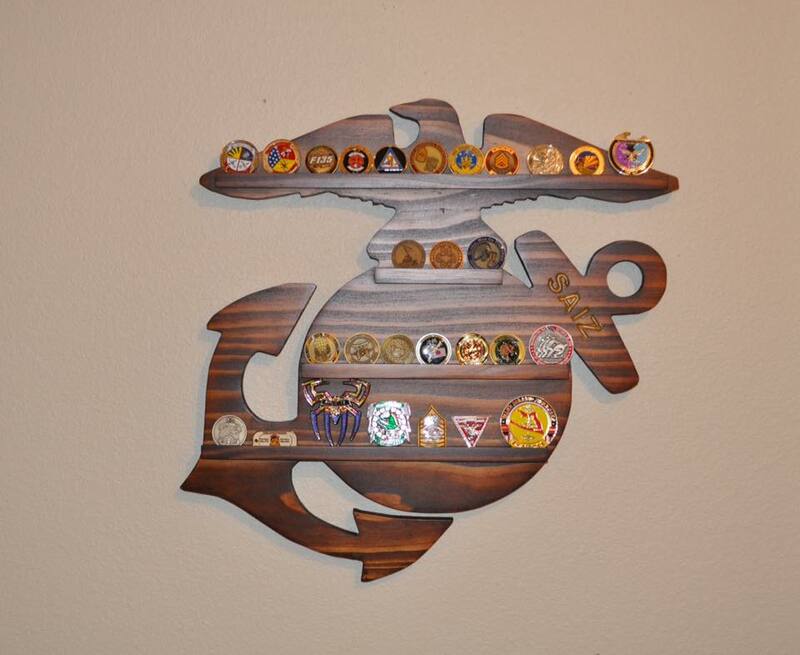 This is a Marine Corps Sergeant Chevron (E-5). 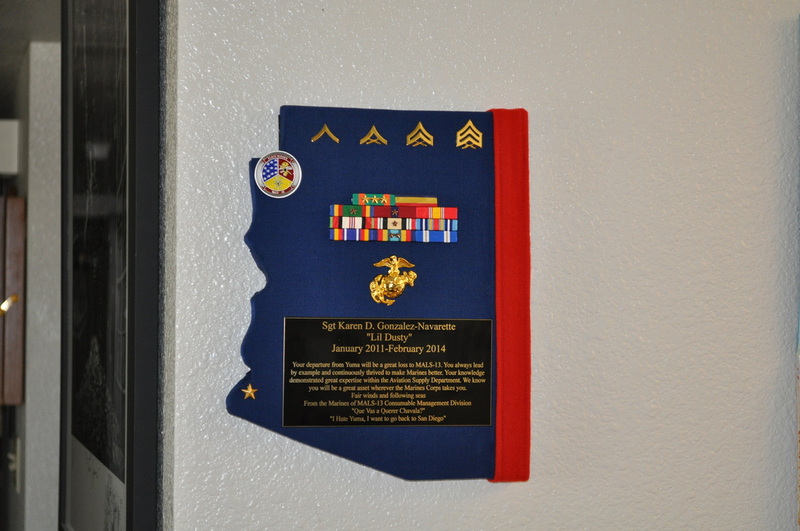 It is 10 inches wide by 14 inches tall. 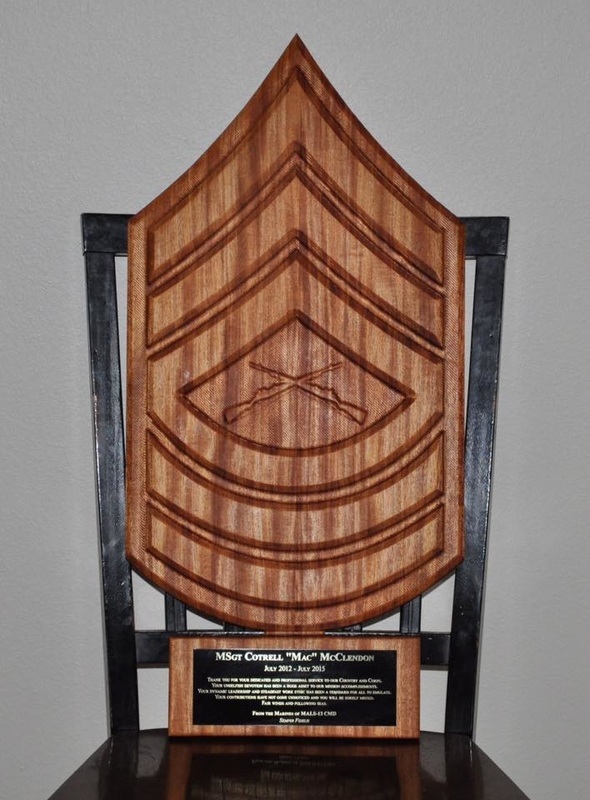 This is a Marine Corps Gunnery Sergeant Chevron (E-7). 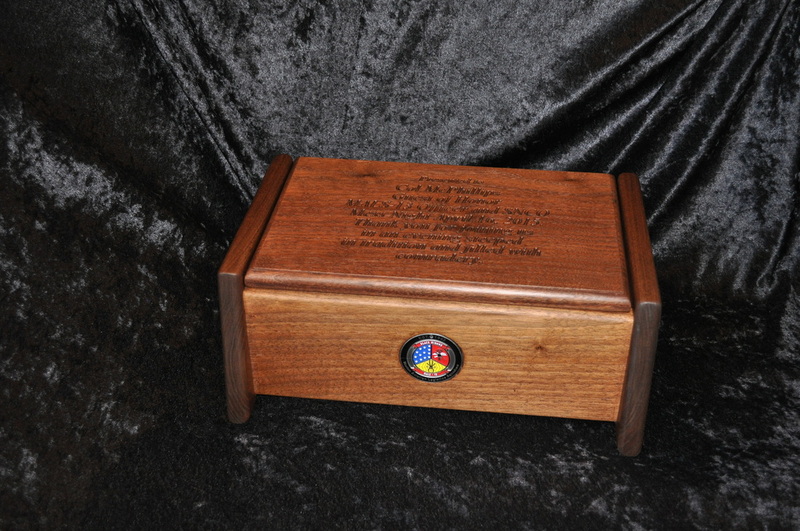 It is 10 inches wide by 14 inches tall. 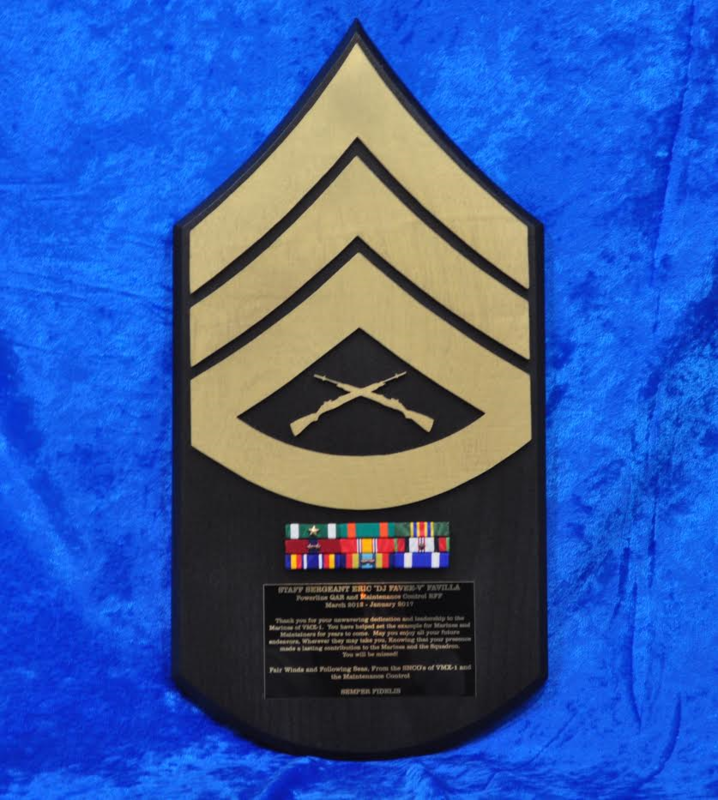 This is a Marine Corps Staff Sergeant Chevron (E-6). 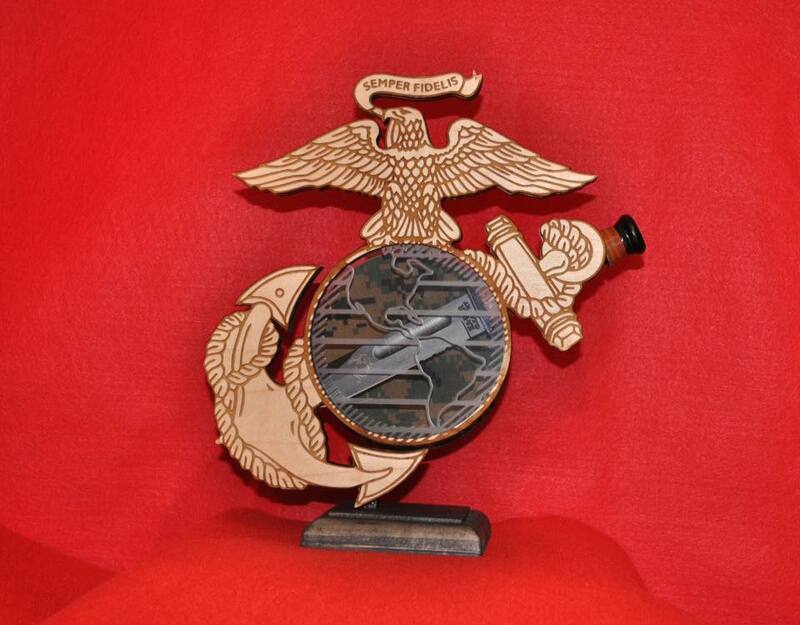 It is 10 inches wide by 14 inches tall. 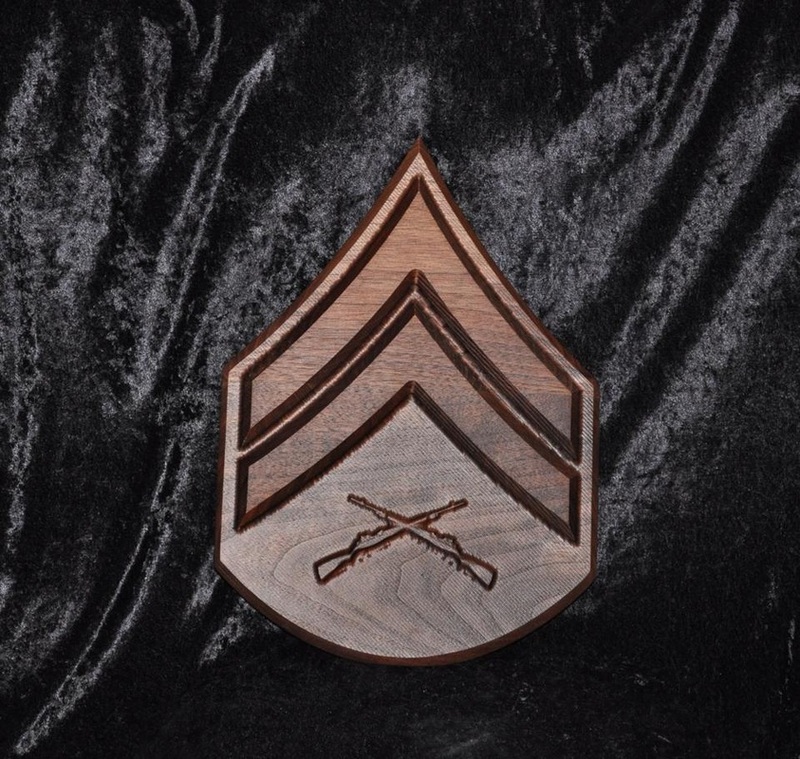 This is a Marine Corps Corporal Chevron (E-4). 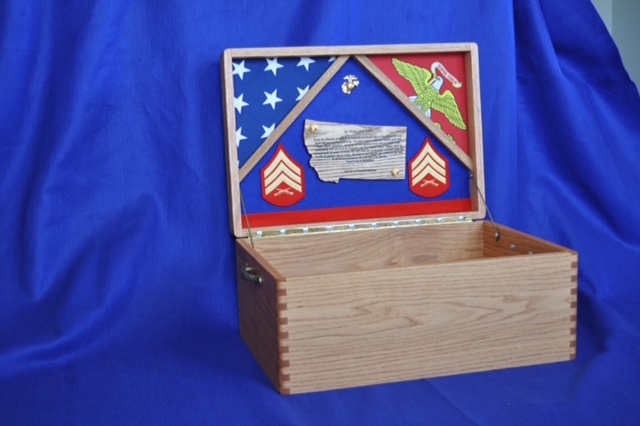 It is 10 inches wide by 14 inches tall. 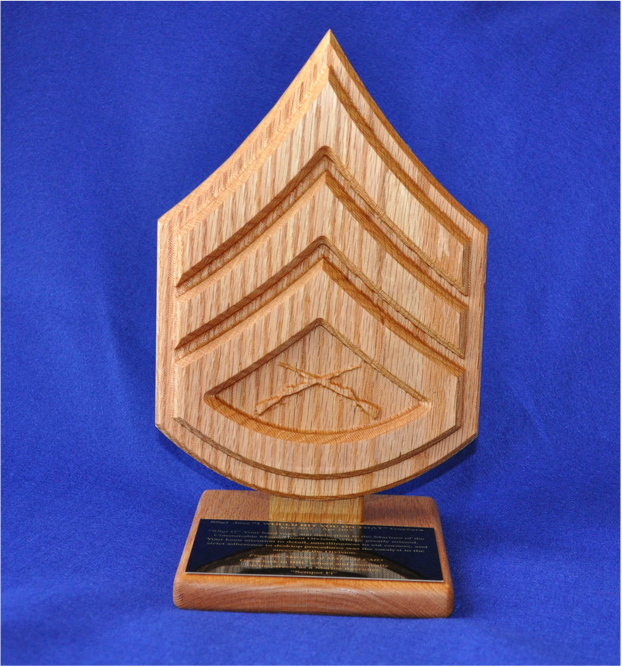 This is one big MSgt Chevron Plaque 29 inches tall by 13.5 inches wide. 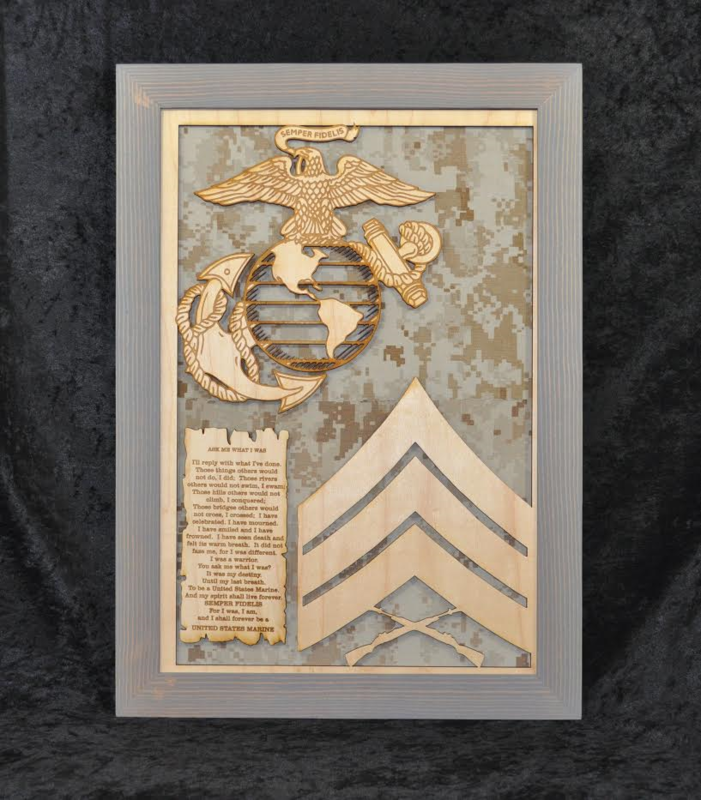 Over 2 feet tall this plaque would look impressive on any ones wall. 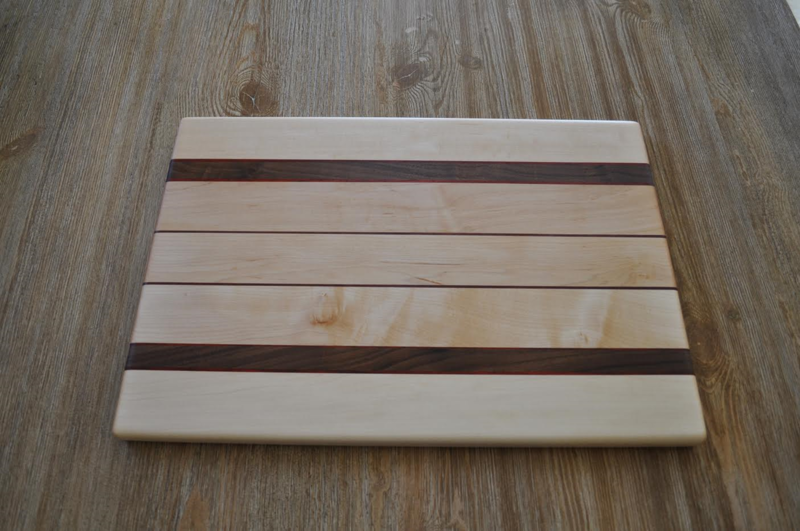 Made out of Sapele wood. 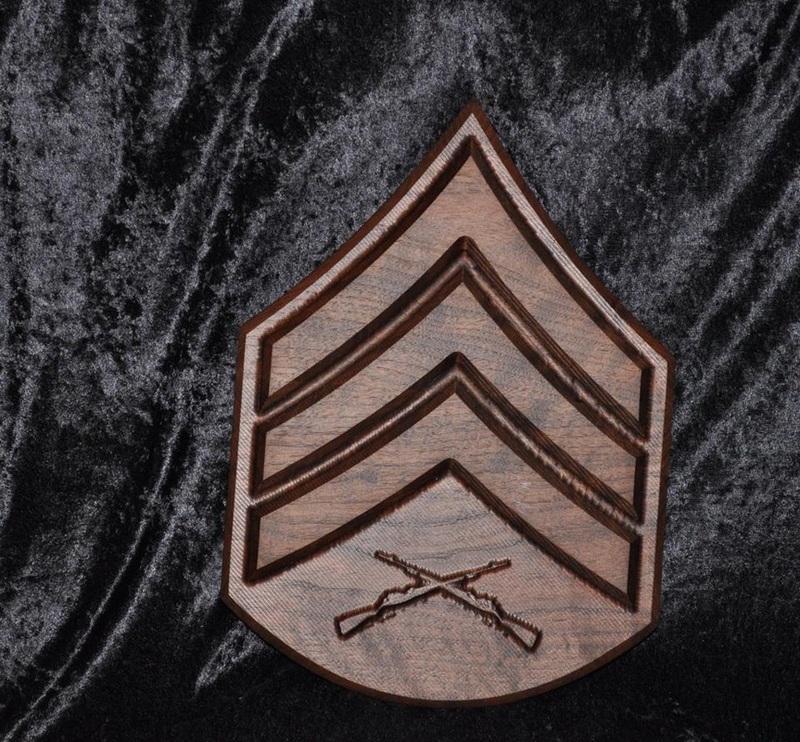 Add instant flair to any desk or space with this rank insignia pen/pencil holder. 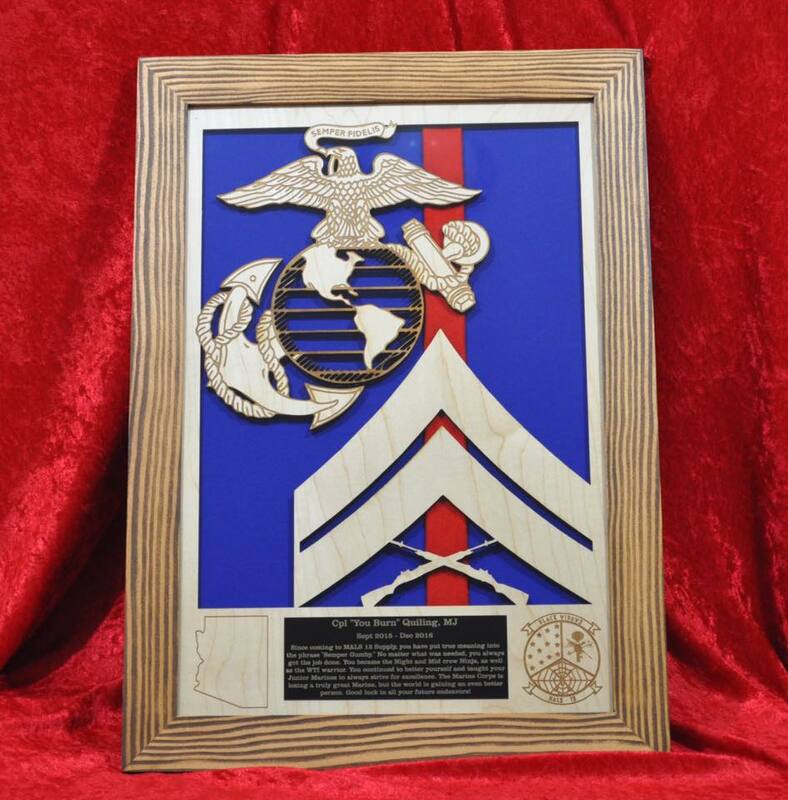 Customize it by engraving the name on the base or add an engraved plate and whatever you wish to include in the write-up. Built to your needs, size, style just let me know what you would like. 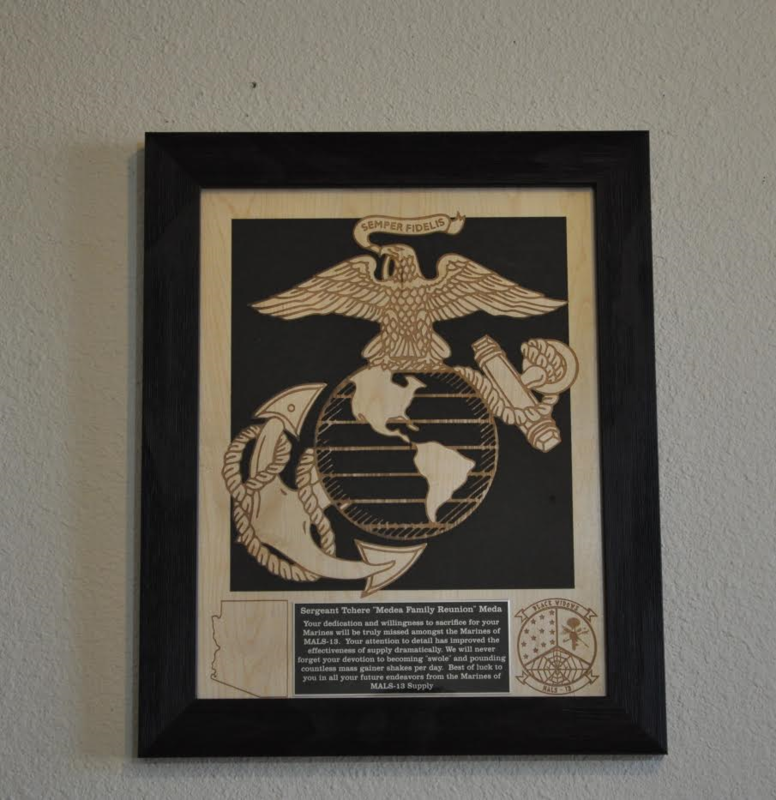 ​Different styles available, Choose the size 11x14 or 12x18, stain color, background. 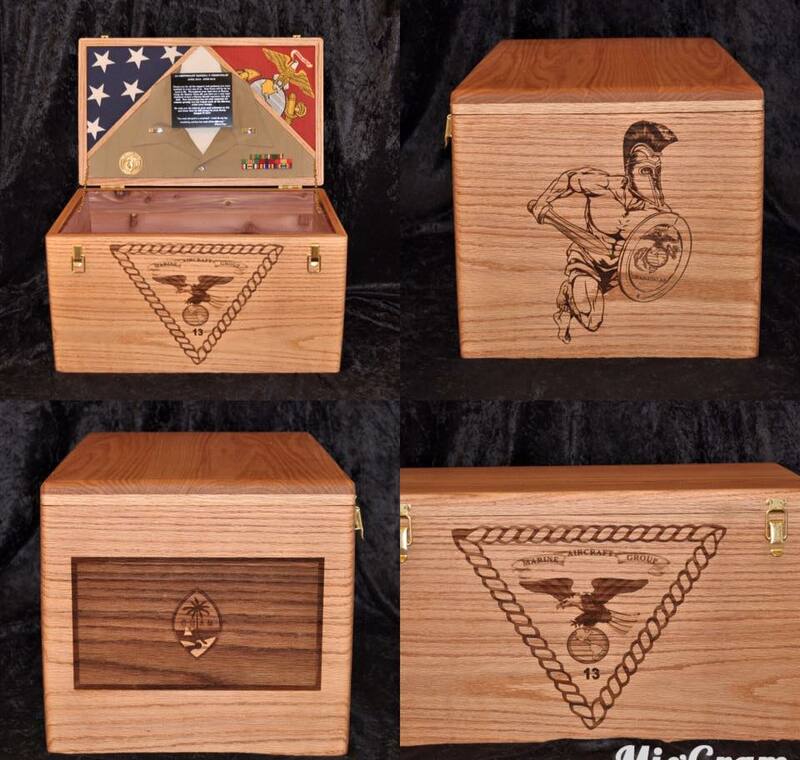 Totally customized to fit your need or occasion. 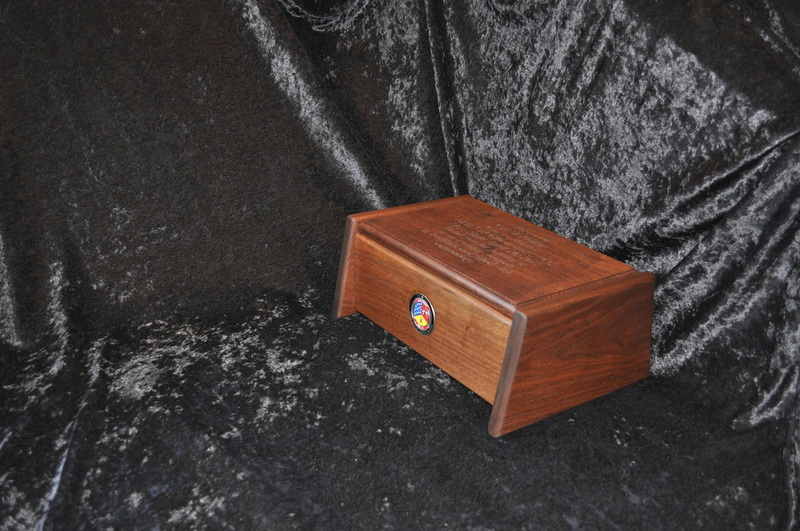 12x18 inside dimensions, 20.5x14.5 with frame. 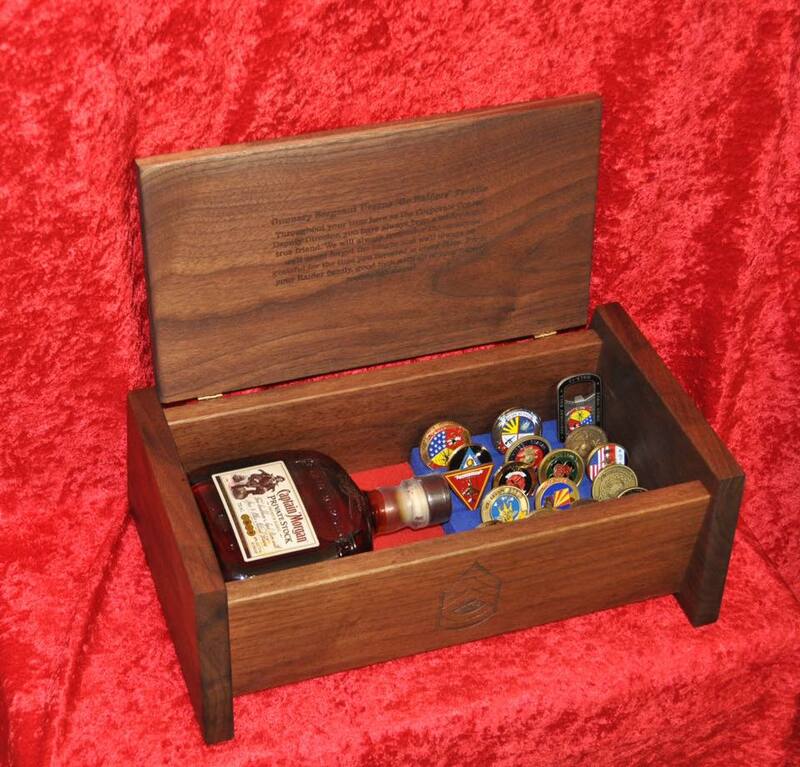 The possibilities of this box are many. 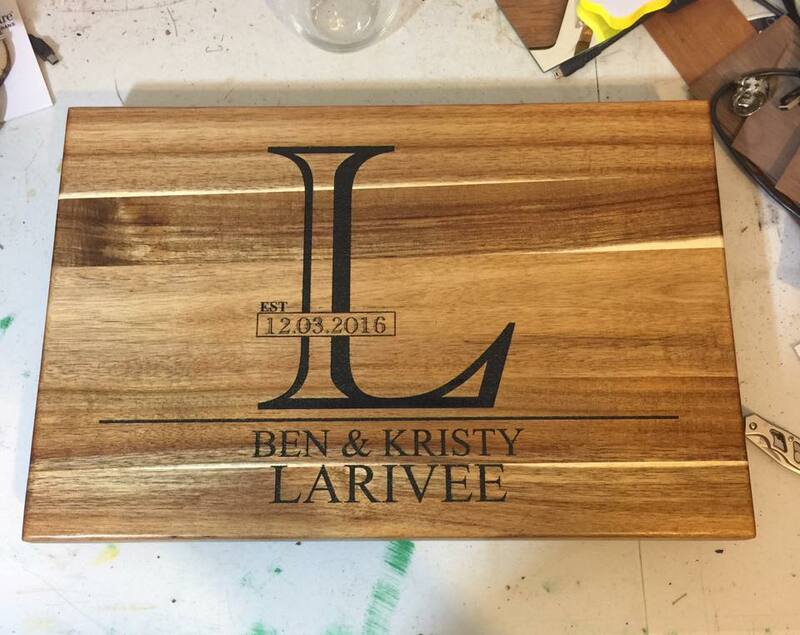 Great wedding gift to keep items from the first year of marriage. 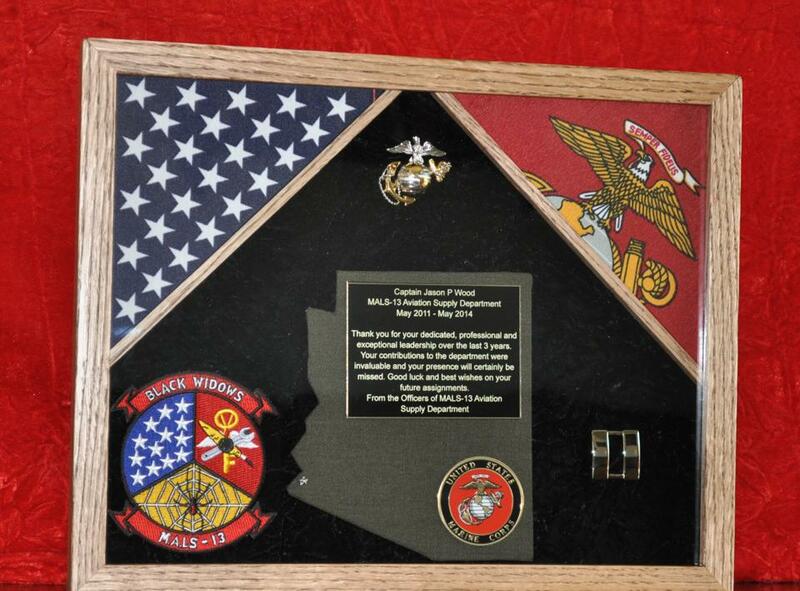 This would also make a great anniversary gift. 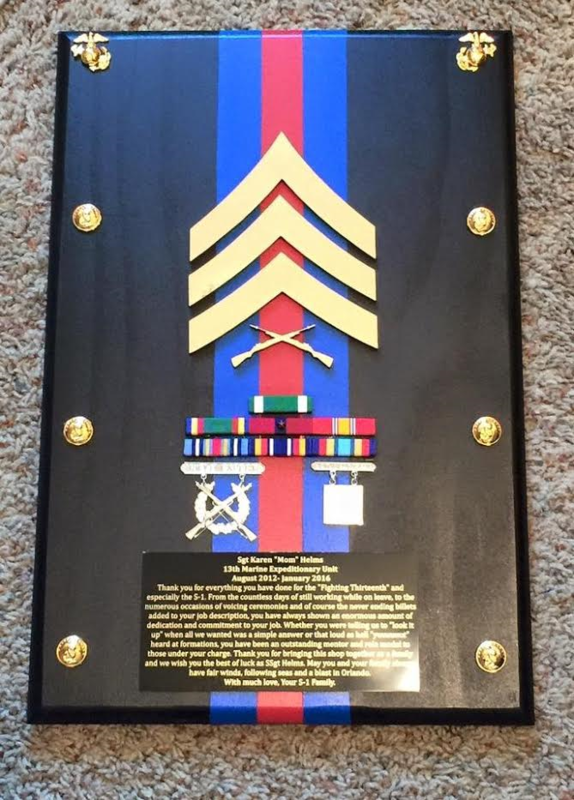 Retirement gift, guest speaker gift. Great for C.O.s and X.O.s when they PCS or anyone for that matter. 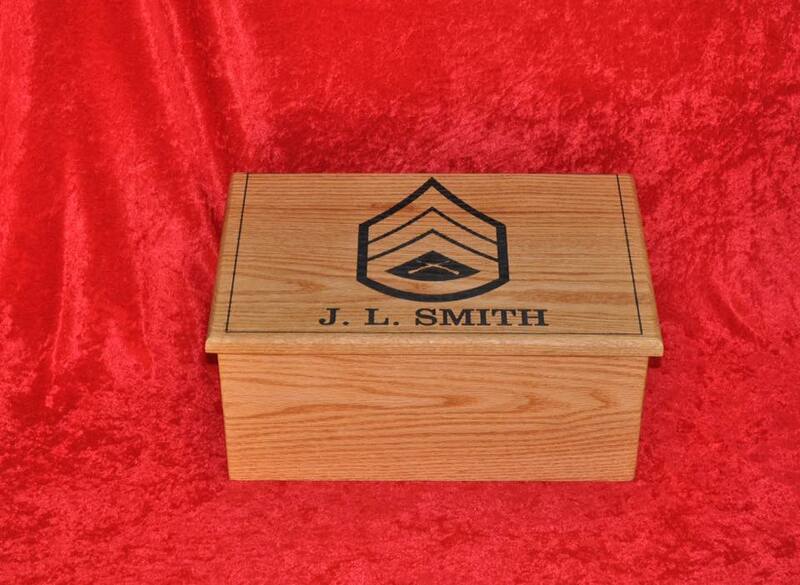 The box in 13 1/2 "W x 9 1/2 "D x 5 1/2 "H. The lid can be engraved on the inside and out. 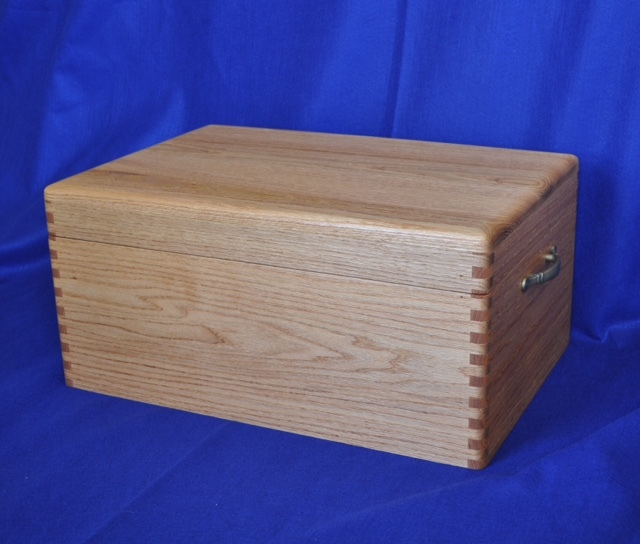 I can Cedar line or felt line the box if you would like to step it up to the next level. Word Engraving is FREE. 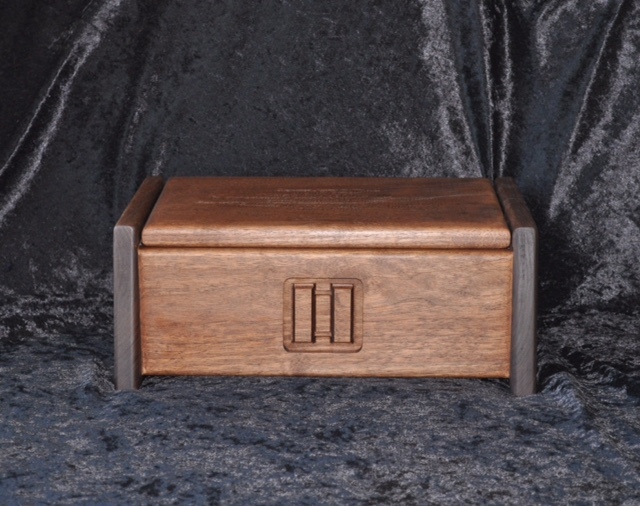 The box shown is Walnut with a cedar lining. 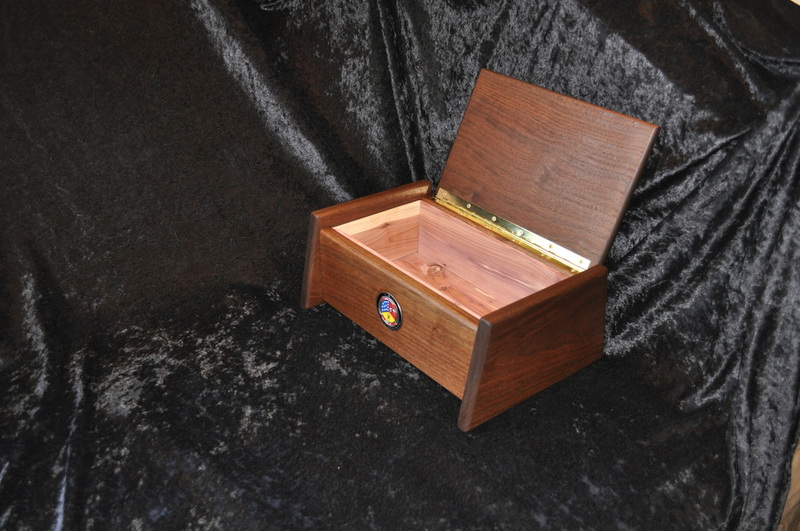 Walnut box with cedar lining and Captain rank engraved on the front. 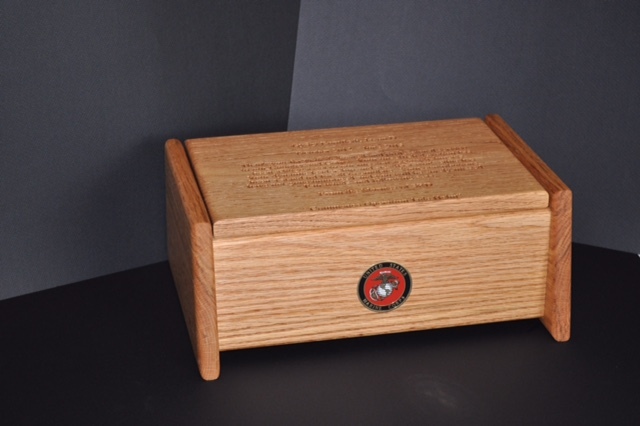 Oak box with a cedar lining and Marine Corps seal on front. 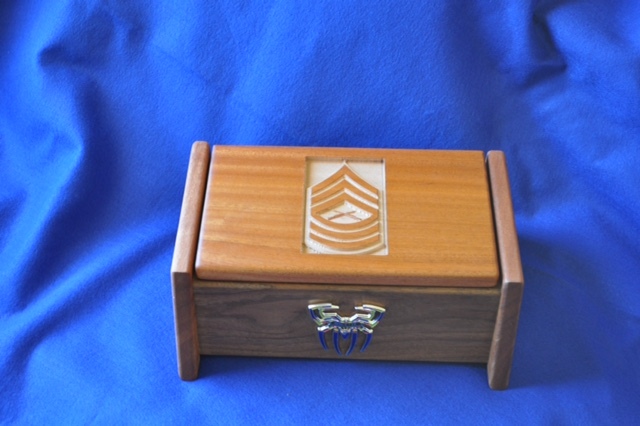 Walnut and Sapele box, cedar lined with unit coin on front and MSgt rank engraved on the top.